Edit - the map below no longer works try this GTA V Map instead. I wondered how long it would be until a Google Map of GTA IV would appear. The answer was not very long, with IGN being the first off the mark with this user contributed map. IGN have created image tiles from the static GTA IV Liberty City map to create an interactive map using the Google Maps API. The map includes a large number of selectable layers organised into different categories; Points Of Interest, Restaurants, Shopping, Services, Entertainment and Nightlife, Emergency Services, Missions, Items, Vehicles, Secrets, Multiplayer and NPCs. 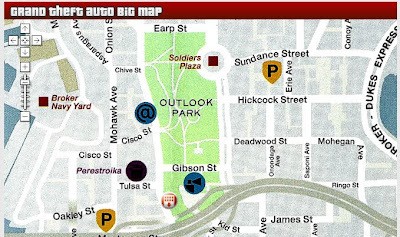 Registered users of the site are able to add markers to the map by right clicking on the map and logging in. This should mean that map will become more and more detailed over time. So if you are searching for something in this huge new game IGN probably has it mapped. Wikicrimes is a new Brazilian crime map created by Professor Vasco Furtado from the University of Fortaleza in northern Brazil. Frustrated at the lack of official crime data available to the public in Brazil the professor decided to create his own user generated map. To register a crime users first find their location on the map and click on the map. An information window then opens with a form to enter the details of the crime. Registered crimes are colour coded on the map in three categories, robbery, theft and other. The majority of crimes that have been registered so far are in Brazil but thanks to coverage from the BBC crimes in other countries are also beginning to be registered. One police department that does produce official crime data is the Garner Police Department in North Carolina, USA. Not only do they publish local crime statistics but they also plot the crimes on a Google Map. The map can be searched by address. You can define the distance from the address you wish to see crimes for and you can decide whether to see crimes for the last three months, the last six months or for the last year. There are also a number of different classifications of crimes that you can choose to view and the crimes that are tagged on the map are colour coded under the same classifications. Google Earth 4.3 has been released. Be sure to check out the Google Earth Blog for a much fuller analysis of Google Earth's new features, including: streetview, day/night lighting effects, faster loading 3d buildings and much, much more. The 72nd Golf Masters is under way in Augusta, Georgia. The Masters Augusta Course (dead link removed) is a Google Map of the Masters course at Augusta. The map gives a description of each of the eighteen holes on the course. The map also makes use of the Google Ajax Feed API to bring news of the Masters via Google, Yahoo and the official site of the Masters. Robert A. Rohde has dropped us a line to share his new variant on sea level rise mapping. The Sea Level Rise Explorer describes itself as a Google Maps mashup that lets you explore the areas of the earth most vulnerable to sea level rise. The site lays out and explains in detail the potential for sea level rise as well as the accuracy of the maps that are used. The Google Map that is featured on this wiki-style page includes a color coded map that shows the elevation of the land relative to sea level. This tool mashes up sea level data which is primarily from version 2 of NASA's Shuttle Radar Topography Mission (SRTM) and other sources. TripTouch is a travel home page for independent travellers. What sets TripTouch apart is the sheer wealth of information available. Not only does the site provide information about various locations around the world, including weather reports and currency rates it also has a number of community features. Users can publish their vacation photos, blog about their trip and keep in contact with the people they meet. 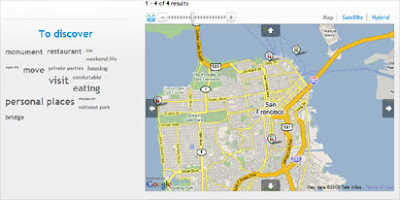 TripTouch uses a small Google Map on each location page to illustrate the destination. The map can also be viewed in full screen. Map Channels Hotel Directory is an amazing Google Map that performs a hotel availability search of your chosen destination and then tags the search results on a Google Map. The results can be sorted by price, guest ratings or hotel name so it is very easy to quickly find the hotels within your price range. When you click on a tagged hotel on the map an information window opens providing a picture of the hotel, the hotel's best rate and a link to more information. If you are lucky enough to be heading off to France then CyberGites can help book your accommodation. The site is a directory of holiday rentals, bed and breakfasts, and camp farms in France. You can search the directory by type of lodging and location. The individual results include details of each accommodation, a calendar of availability and a Google Map of where it is located. Before leaving on your vacation it is always a good idea to find out a little about your destination and what you can do once you are there. Nomao (dead link removed) is a community recommendation service for places and events. It lets you search a location for restaurants, museums, activites etc. The results are then shown on a Google Map. When you click on a tagged result a user review of the location appears under the map. Trusted Places (remove) is a similar website for UK locations. Each city page gives a wealth of information about this week's top community reviewed restaurants, bars, cafes and clubs. Clicking on an individual result will generate all the user reviews of that location, a Google Map and a list of other reviewed destinations near-by.